Super easy, super delicious. You’ll find this apple cake has a surprisingly moist and light crumb, even without butter. Recipe from The Calories In, Calories Out Cookbook: 200 Everyday Recipes That Take the Guesswork Out of Counting Calories—Plus , the Exercise It Takes to Burn Them Off © Catherine Jones and Elaine Trujillo, 2014. Reprinted by permission of the publisher, The Experiment. Available wherever books are sold. Center an oven rack and preheat the oven to 350°F (180°C). Grease a 13 x 9 x 2-inch (33 x 23 x 5 cm) baking pan with cooking spray and lightly flour; set aside. In a bowl, combine the flour, baking powder, baking soda, salt, cinnamon, nutmeg, and ginger and whisk together; set aside. In the bowl of an electric mixer, combine the sugars with the eggs and beat on medium speed for about 4 minutes, or until light and fluffy. Add the canola oil and yogurt and beat for 30 seconds more. Add the dry ingredients and beat on low speed just until blended, about 30 seconds. Then, using a rubber spatula, fold in the apples until well incorporated. Transfer the batter to the prepared baking pan and spread it evenly. 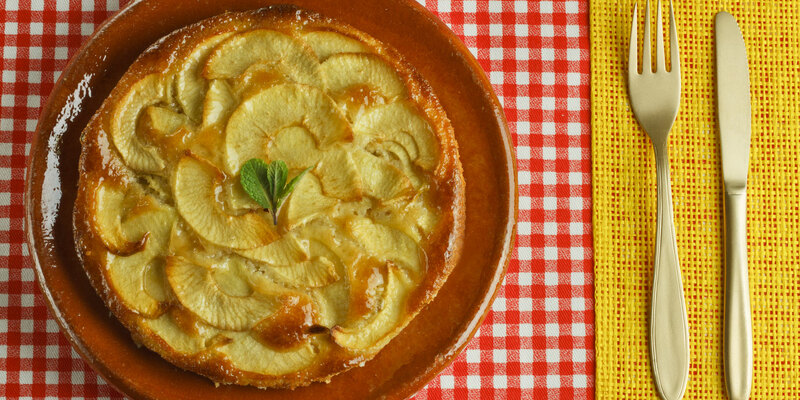 Bake for 45 minutes, or until a cake tester inserted into the center of the cake comes out clean and the apples feel soft. Remove the cake from the oven and cool for 5 minutes. To unmold, run a knife around the sides of the pan and invert the cake onto a cooling rack. When cooled, invert it again onto a serving platter. Dust the cake with confectioners’ sugar, if using, before serving.